Happy New Year everybody. Looks like it’s time for a community clean-up. And it’s all happening this Saturday, January 9th! 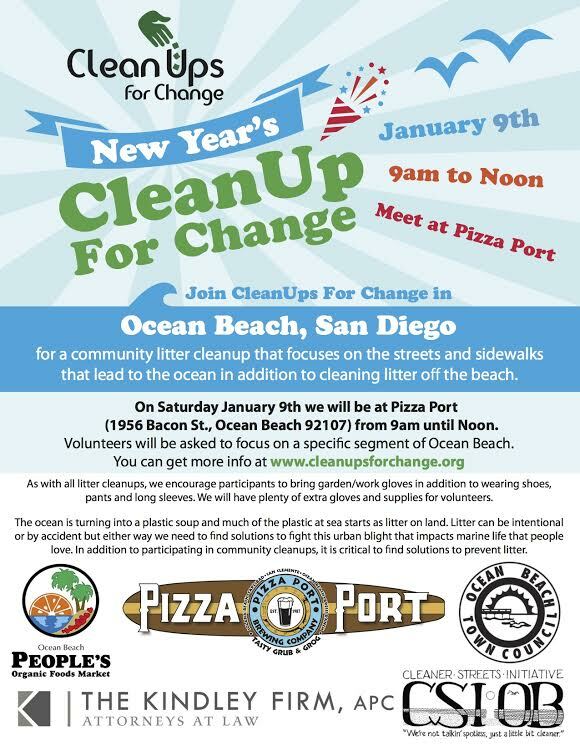 CSI-OB is teaming up with Cleanups for Change and Pizza Port OB and other groups to start off the new year with one – and from what the storms have done – OB needs a community cleanup. Join us as we take to the streets, alleys, parks and beaches to show OB some love. We have limited supplies, but bring a bucket and gloves if you can. Meet at Pizza Port at 9:00am and we will assign you an area. We are hoping to match or exceed last year’s record of 117 volunteers and over 500 pounds of trash removed from OB. We can’t do it without your help so spread the word and come on down to lend a hand. And yes, there’s an after-party! CSI-OB thanks Pizza Port OB, OB People’s Organic Market, the Kindley Law Firm, BK Printing, the OB Rag and the Ocean Beach Town Council for their support. Support Local Businesses who support us! I’ll be there….. if it is not raining.